Current location Still in the Portsmouth area? Robin Aisher presented Yeoman VI to Ringwood Grammar School (RGS) for use as a sail training boat by the pupils. RGS was an independent day and boarding school for boys located in Bournemouth, UK. The headmaster Cmdr. A. O. N. Forsyth was a keen sailor and sailed regularly with Owen Aisher in offshore races. Yeoman VI kept her original name and was moored in Poole Harbour on a swinging mooring at the Royal Motor Yacht Club. She was extensively used and enjoyed by the pupils of RGS. RGS entered her for the UK selection trials for the 1968 Olympic's in Acapulco, Mexico. A total of three boats competed. I was on board in the practice race and Yeoman VI was lapped by Robin Aisher sailing his latest Yeoman with Adrian Jardine and Paul Anderson and they then went on to win the Bronze medal in Acapulco. In the early seventies she was sold to new owners and moved to the Portsmouth area. I spent many happy times in the '60s sailing in Poole Bay on board Yeoman VI. 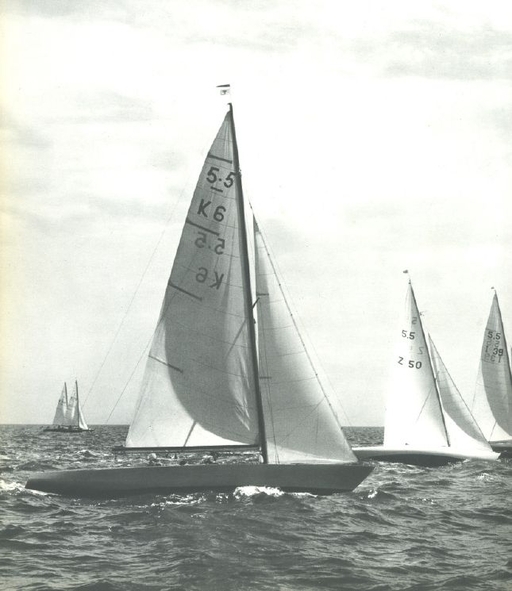 According to information from the National Maritime Museum in Greenwich, UK (from their Camper & Nicholsons Ltd files and Lloyd's Register of Yachts), GBR-6 (K-6) was Yeoman VI, owned by Robin Aisher from 1959-61. Camper & Nicholsons Ltd Design No A176, C&N Yard No 841.